you learn how to help your clients make lasting change. Click here to schedule a discovery call with Linda Fogg-Phillips to discuss if certification is right for you. Want to be the first to know when we open new classes? Click here to get on the "Priority Notification List". The sessions below are open for enrollment. Click on the date of the cohort that you want to join and you will be taken to the enrollment page. Start Date of Tuesday April 30th at 10:00 am PT – This session is closed. Click here to be put on the waitlist. We will let you know if a seat becomes available in this session. For most people today, behavior change feels hard and scary. They have tried and failed many times before. But here at Tiny Habits Academy, we have good news for you — and for your clients. The Tiny Habits method is easy and approachable. It’s very effective at changing behavior, and it changes how people feel about themselves. In fact, the research we do week after week shows that Tiny Habits quickly builds people’s motivation, confidence, and hope. And as you know, that changes the game for you and your clients. Join us for our our live, hands-on training and we will teach you how to create fast wins for your clients. We give you the exact step-by-step process for creating these successes. As a result, your clients will quickly see evidence they can change. And soon these small changes will multiply and grow. Change leads to change. Success leads to success. That’s the why Tiny Habits works so well. The Tiny Habits method is not an accident. Over the course of five years, Stanford behavior scientist Dr. BJ Fogg created this method by drawing on his breakthrough models of how human behavior really works. He tested the method on himself. Then he tested it on friends. And then he shared it with thousands of strangers around the world. He found remarkable results at all levels. If you search “Tiny Habits” online you can see the successes for yourself. Click here to get a report of the results that Tiny Habits Certified Coaches are getting with their clients. Our program will boost your personal impact — and your career. When you use the authorized Tiny Habits method and materials with your clients, you will see remarkable success. That’s a guarantee. Don’t be surprised when your clients send you “thank you” notes or when they brag about you to their friends. With our digital coaching platform at your fingertips (even on your smart phone), you will be able to work with many clients at once, without location or financial restrictions. Our trained coaches can guide over 100 people each week, in less than an hour a day, and the results are very good. With the Tiny Habits method and exclusive resources, you can help more people, with better results, and increase your earning potential. As a certified Tiny Habits Coach, you can charge whatever you want for your services. No restrictions. Do you want to work from home? That’s great. We give you the tools to be effective. Are you working in a big office or a busy gym? That’s good too. You can coach clients in person, in groups, via phone, or through email. Our research shows all these approaches work. With Tiny Habits, you have freedom and flexibility. When you learn our breakthrough method for habit formation–and exactly why it works–you will become a true expert in human behavior. This expertise will set you apart from your peers; it opens the door to promotion and leadership. Why? Because unlike your peers, you will actually know how to change behavior, and you will have evidence that you get real results for clients. Imagine that: Statistics of your success, and quotes from clients praising you. That’s all part of our platform package. 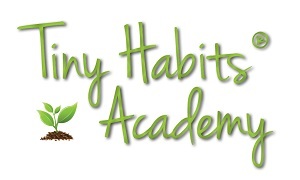 Tiny Habits Certification Course — How it works . . . The Tiny Habits Certification Course provides you with 6 weeks of training in the Tiny Habits method. We teach you, step by step, how to improve your clients’ lives using this breakthrough method, our custom resources, and our exclusive digital platform (We call it “Greenhouse”). We limit the class size so we can have high-quality discussions and interactions. The learning experience is customized to you and your classmates. You wrap up the course with an apprenticeship to get hands-on experience to master the Tiny Habits method. We help you every step of the way. After Class 4 we help you apply what you’ve learned in an apprenticeship. You will coach 30 people in the Tiny Habits method. Don’t worry: We will help you. You’ll invest about 30 minutes each day. By week two, you won’t need our help. You will be creating changes in the lives of the people you teach. At the end of the apprenticeship, we will gather your results and present to you statistics and statements that show your impact. You will be delighted how quickly you have effectively improved people’s lives. Live virtual training (twice a month) with BJ and Linda. Video recordings of past 3 months of coach trainings with BJ and Linda. The Tiny Habits Library with teaching and coaching resources. Membership to the Tiny Habits Certified Coaches private Facebook group. Discounts on BJ’s Boot Camp in Behavior Design and his Stanford training events. Over 30 additional Tiny Habits videos that BJ has created to increase your skills and to use with your clients. Stats and testimonials about your own effectiveness as a coach. Your own “coach” page on our website. An opportunity to use a Tiny Habits branded email. An opportunity to use the 5-Day Tiny Habits Coach automated email platform to coach your own clients. We guarantee our training will make you a true expert in how to create habits–and how to change lives.